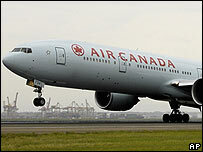 An Air Canada flight made an emergency landing in the Irish Republic after a pilot apparently suffered a breakdown. A passenger said the pilot was carried from the plane shouting and swearing, saying he wanted to talk "to God". "At no time were the safety of the passengers or crew in question," said an Air Canada spokesman. "The flight was met by medical personnel and the individual is now in care." "He was very, very distraught. He was yelling loudly at times," he told the Canadian Broadcasting Corporation. "He was swearing and asking for God and very distressed. He basically said he wanted to talk to God."